Last week I received this amazing care package from Keen Canada, which among a handful of awesome gifts, included a stylish pair of Persol sunglasses and a brand new pair of their Citizen Keen boots. As I mentioned on Instagram, second only to my camera, a good pair of boots makes all the difference when I'm out on a travel shoot. Keen Canada reached out to me back in the summer, but I had no idea they would be sending me such a generous gift. 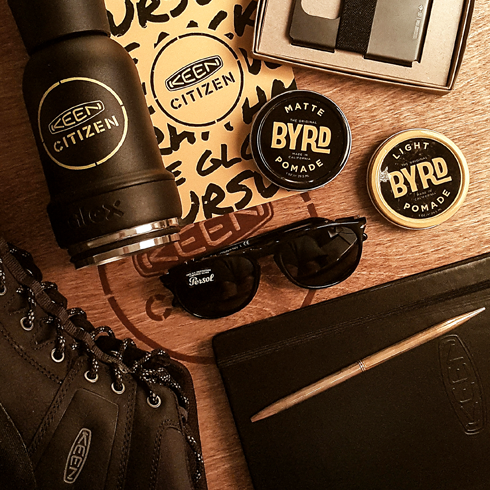 Enclosed in a beautiful wooden box, and in addition to the boots and sunglasses, the package also included a personalized note, leather journal, Byrd pomades, a travel thermos, and a slim metal wallet. Excuse the shout out, but I felt Keen Canada really deserved this one. I was impressed with the care and attention to detail that went into putting this together. I just wanted to make it clear that it didn't go unnoticed. So, thanks very much to Keen! You're bound to notice these boots popping up in a few of my familiar "foot shots" in some future travel adventures.